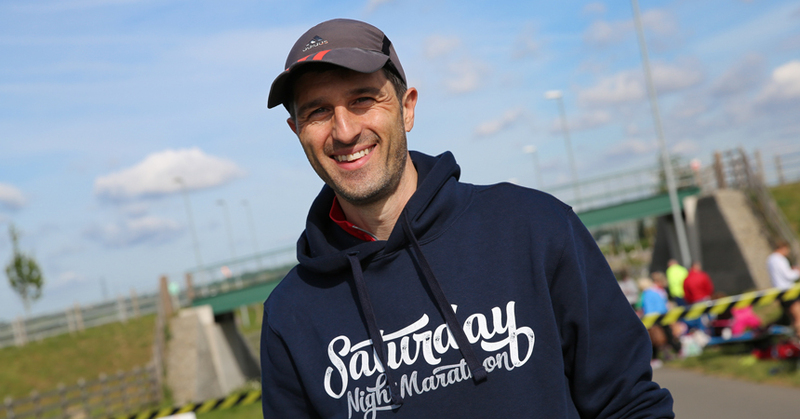 The Kent Roadrunner is a superbly organised marathon event hosted by Ian Berry / TZ Runs. The event is held at a Cyclopark venue in Gravesend in Kent and involves runners completing 17 laps of the circuit. The event is now in its 4th year. I took part in the first year in 2012 and had always planned to come back to it again. Unfortunately it falls a week after the GUCR so not the best time to run it with 145 miles in your legs the weekend before! 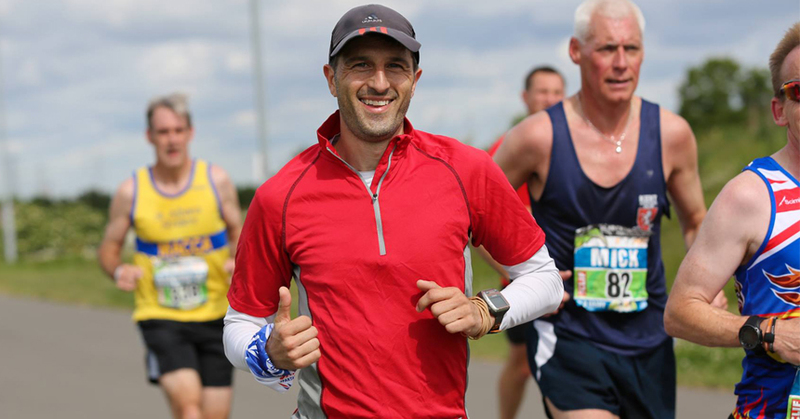 The event is medium sized with about 400+ runners taking part and is fun and friendly with the lapped nature of the course ensuring you see the same people each lap. In addition the event has a number of distinctive features such as the ‘giant’ (no really its huge) medal, showboating contest, reverse marathon runner/cheerleader (well done Matt), fancy dress theme, families and friends being able to setup aid station around the course and support their runners, video footage via a drone camera. The attention to detail and effort Ian and team have gone to is fantastic and the venue is perfect being enclosed, with parking and great facilities (cafe, toilets, showers etc)… as long as you don’t mind running laps. The weather was warm and sunny as I drove to the start. My running since the GUCR has looked like this Monday (sofa day), Tuesday (hobbled around) Wednesday (hobbled around), Thursday (2 mile jog home then had to walk the rest of the way), Friday (4 mile jog home). As I stood on the start line and said hello to a few friendly faces (hello to Stuart March who was pn official photography duties today). I was trying to work out the best tactics for the day. I knew last weekends run had left me lethargic and I was wondering whether I should take it really steady from the off and settle in for a easy jog around or shall I go at close to usual marathon pace and then see how it goes knowing that I would fade at some stage? As the race started there was obviously only one answer (who ever really takes is steady?) as I set off at a reasonably brisk pace. 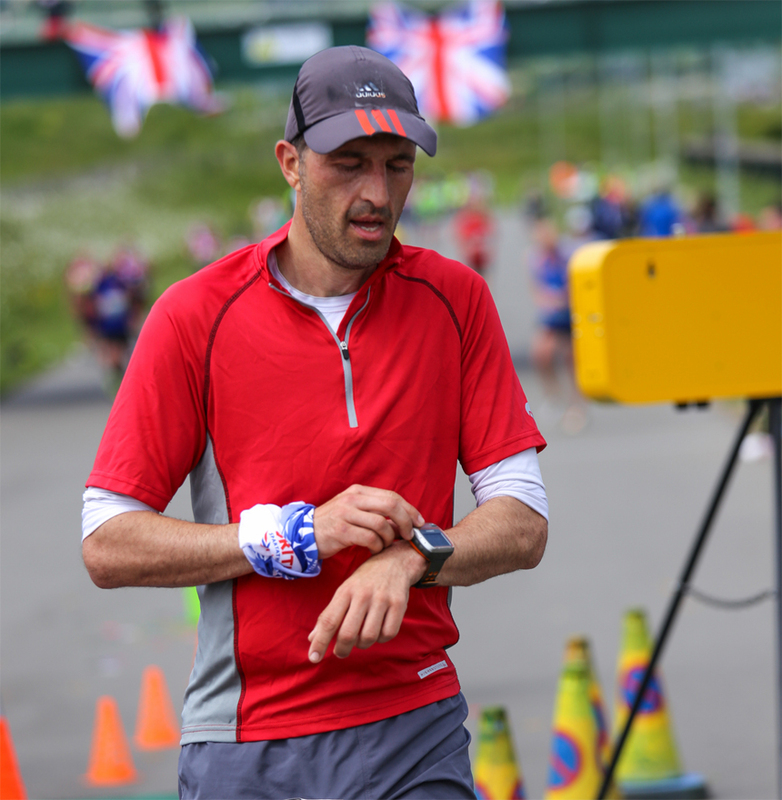 I spent a few laps running with Jon Errington who has run every single Kent Roadrunner event who was good company and then we got separated and I spent another couple of laps running with Jen Bradley before doing a few more laps by myself before seeing both of them again. With a lapped event there isn’t a huge amount to describe as I made my way around the meandering and undulating track. The weather was pretty warm and I stopped to pick up my personal drinks every couple of laps. As the event got spread out I found myself overtaking people with a few people overtaking me and it was nice to say hello to a few people a couple of times including Reading Joggers veterans Nicky and Dave Sayer, Travis Wilcox, Gary Brampton, David “Fenners” (Fenland Runner) Mould amongst others. Pro-tip: Don’t wear grey shorts on a race. Especially don’t do it when you collect a cup of water, try and drink it on the run, spill it on the front of your shorts… just as you pass the start/finish line supporters and photographers. I went through the halfway stage in about 1.36 – 1.37 which was much better than expected and carried on with the effort. I had half a thought about easing off the second half but forced myself to keep up the pace as much as I could with a little nod to last weeks lack of effort. My Garmin mile splits look a little uneven but each lap was about 1.3 ish miles so each mile takes place on a different part of the course. I felt I was running fairly evening with only one brief loo break and a couple of ‘slow down to pick up my drinks bottle’ it was running all the way even that cheeky small rise at the bottom the track near the finish line (Note to Matt Dunn, I ran this every time – that’s progress from 2012). I found the course to be tough on the legs due to the hard surface (it is a cycle track) and with the little ups and downs and by the last few laps I could definitely start to feel the quad muscles aching. In fact slowing down and then trying to bend down and pickup my bottle of the floor became a little harder towards the end! It was also pretty warm and I witnessed one runner being attended to by the Paramedics and I hope he was ok in the end. I was carrying a set of elastic bands and removing one of these each lap as a way of counting down the laps and was pretty relieved when these got down to the last few. However, these last few laps were tough on the legs and the effort started to tell and it was ‘time to get the hurt on’ by trying to maintain the pace towards the end. I felt I deserved a little bit of punishment to make up for last week. However despite my effort, I did start to fade on the last couple of miles as I felt a bit of tiredness and some discomfort on the legs… the quads were definitely very sore now. I ran around the final lap trying to be positive and then made a surge over the last 100 yards or so to finish in 3.18, hot, sweaty, aching and tired but happy. 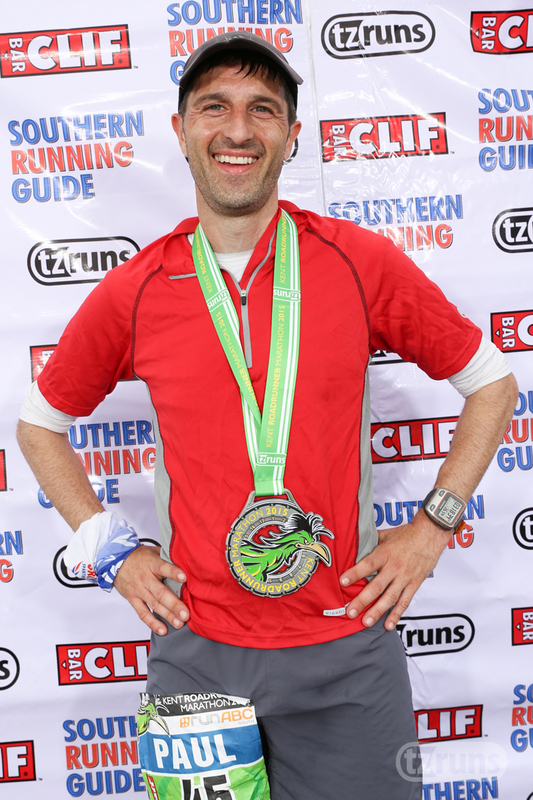 Despite being a good 10+ minutes off my PB, I was delighted with the effort so soon after the GUCR. As mentioned at the start, the medal is massive and definitely a talking point! After completing the race I took advantage of a sports massage which meant my quad bashed legs could make a slow walk rather than a hobble and used the shower facilities to shower and change before heading home. A good day out and an event I would definitely recommend to others. Thanks to Ian, Sandra and team for a superbly organised event. Bloody amazing time given GUCR last weekend. Nice bling too ! That is amazing so soon after the GUCR, and a wonder you can still stand up with that dinner plate hanging round your neck! stunning result after the previous week Paul!